Please press your browser's "Refresh" button to see lower page portion if after the first loading you can't see anything below this line. and new version 24-p booklet (S26T2) posted here Mar. 12, 2019 as English model ebooks! Click the picture below to open the PDF ebook (etract) in a new window...! New version 24-p tract (S28T1) posted here Mar. 12, 2019 as English model ebook! 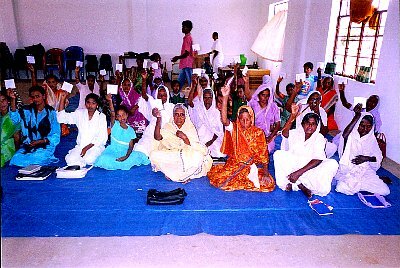 New Hindi and Tamil language tract-booklets (ebooks) were posted here on Mar. 12, 2019...! using any printer that can do double-sided page printing! in a new window and then print on paper from the PDF file! CLICK ANY OF THE ABOVE PAGE-PICTURES TO OPEN AN EASY-READING EBOOK VERSION IN A NEW WINDOW. OR RIGHT-CLICK AND SELECT "SAVE TARGET AS" TO DOWNLOAD THE FILE TO YOUR COMPUTER. Click the pictures below to read each booklet as an HTML Indic language slideshow message! 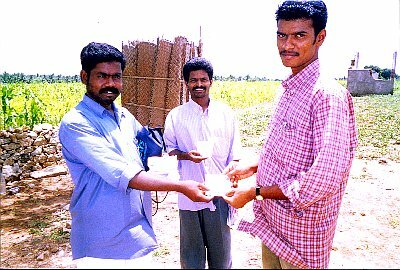 Now you can read online & share with others a great many Christian evangelism booklets written by Ken Street and translated by the R. K. Street Tracts League of India -- with 10 already translated into 4 Indic languages and published by India's Mass Media Gospel Mission. Translations into Tamil, Malayalam, Telugu, and Hindi have already been made and will be freely available here. Our own Korean translations will be found here too. Two Nepali translations and a Burmese and a Mizo translation will be coming soon. And it's all free. They are all put online in South Asian, Southeast Asian, and East Asian languages for your study... to lead you and other people to an enlightenment in Jesus Christ. More than 85 free evangelism messages suitable both for those persons who are lost in "a sea of troubles" and for those persons who are "Fishers of Men!" Study these Christian messages, learn wisdom from Jesus, and share God's Truth with other people! Help Jesus catch fish for His worldwide net, so that they will ultimately live to see the Kingdom of God! Or just get help for yourself, the help you need. Put all this to good use; it's all part of a new Way station called JesusChristSriLanka.com. 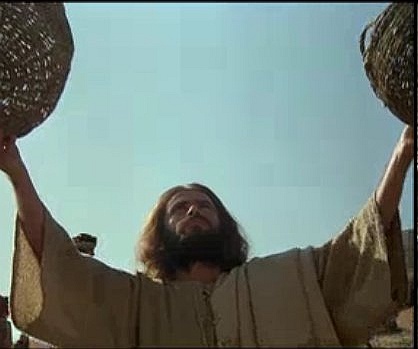 And please remember: Jesus walks softly and carries a big net. Jesus Walks Softly With A Big Net, But With A Big Stick Too! Version1b, Oct. 26, 2006. Copyright 2006 by Roddy Kenneth Street, Jr. Here's a surprising fact that you maybe haven't ever realized: Did you know that Jesus fishes? He still fishes, even today, even in our modern world. Yes, indeed! He walks softly and carries a Big Net! Jesus was once in human form as a humble carpenter on our planet Earth, but today He is a lot more like a fisherman who is casting out a worldwide net! If you are a borderline nut-case in need of medical help, you can be glad that Jesus is the One Who is after you with a net, instead of those guys in the white coats, who chase people with another kind of net. On the other hand, if you are simply a stubborn jackass or a stiff-necked idiot, God may instead surprise you by walking up softly and walloping you in the head with a big stick! Or He may even hit you in the head with a 2" x 4" board, in order to get the jackass finally moving in the right direction. That usually happens only when you are a really sinful unbeliever or "a lazy and worthless servant." You really need to start giving Him your full attention! I know what you're thinking. Jesus probably learned that little trick with the 2" x 4" board during his early years, back when He was just a humble carpenter in Israel! Maybe so! Here's an explanation and elaboration of our humor, made for everybody, but especially for people in foreign countries who don't quite understand the humor of the above paragraphs! You will recall that Teddy Roosevelt once advised that a person should "walk softly and carry a big stick." I think maybe God has a stick too... a rather long one that he uses to wake up people who keep falling asleep every time they listen to a sermon! Sometimes God may have to tap you on the top of your head rather forcefully, just in order to get your attention-- to get you to wake up and see the real world. Now, how can I say that Jesus walks softly with a Big Net, but that He also, at the same time, "walks softly and carries a Big Stick"...? It's like this: Jesus is not only trying to catch a lot of fish-- He is also gathering a lot of sheep, and He's trying to lead these very dumb animals toward the safety of Heaven! 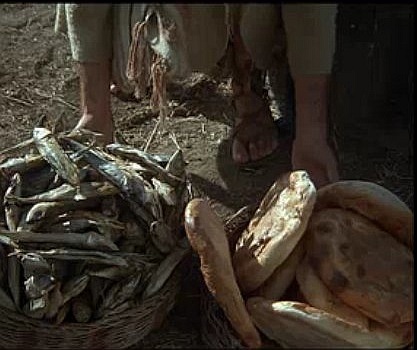 God can take a few fishes (a group of Christian believers) and some bread (the Word of God, the True Manna from Heaven) and with these, through Jesus Christ, He works a great miracle. God takes these few fishes and not only multiplies them but transforms them. The (human) fishes that Jesus seeks to catch are soon transformed into sheep that seek to follow after Him. We follow our Good Shepherd in the path as He leads us. As we do so, amazingly, we start to resemble-- just a little bit-- the wonderful Lamb of God! But sheep are really stupid animals, and that's why Jesus carries not only a Big Net but a Big Stick. In fact, the Bible tells us in Zechariah 11:7 that our Good Shepherd carries 2 staves (long wooden rods) very similar to the ones carried by ancient shepherds two thousand years ago. A shepherd then had one staff used to fight off wild animals, and another that was used to guide the sheep carefully through tight spots and difficult places. Zechariah says that our Good Shepherd has one staff named "Beauty" (or "Grace") and another called "Bands." It looks to me like He must use the first staff to fight off devils and dark forces that seek to steal/kill His sheep. The other stick, "Bands," is the one He uses to guide stupid sheep through the difficult places in our lives. That's the one that He uses to hit you on the head occasionally. It helps you to keep going in the right direction, to stay on the path. It helps Him prod us so that we keep moving in the direction of Heaven, that safe pasture that is waiting for us at the end of our lives. I'd say that when Jesus is leading a bunch of stupid sheep (often-erring Christians), it's a bit like a human being trying to ride a stubborn jackass. The donkey just doesn't want to go where it's supposed to go... and neither do His stupid sheep. That's where the Big Stick comes in mighty handy. You see, Jesus expects of us that we help Him catch a lot of fish, whether it's by hook or by rook or by nook! He wants us to become fruitful trees in His Garden. He can use a former crook, or even a former snook... if He can just get you to pay attention! He's always after the big catch-- whether it's a full net, loaded up with a big catch of "153 fishes"... or a giant pen filled with a lot of rescued sheep that were saved from death just in the nick of time... or the many millions of people He can gather in through a system called the World Wide Net. 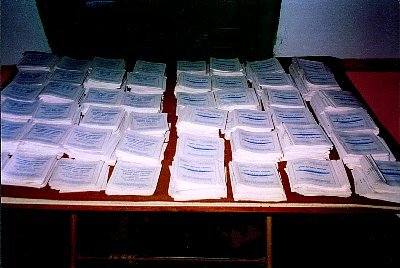 JesusChristSriLanka.com has links to more than 85 free Street Tracts and other good stuff! Our JesusChristSriLanka.com is fishing with a net that catches some BIG fish! A worldwide Jesus net is pulling in its catch! 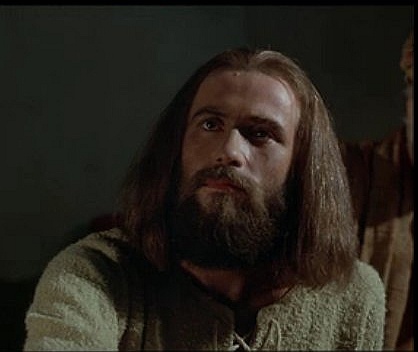 E-mail for JesusChristSriLanka.com and R. K. Street, Jr.
Watch and hear "The Jesus Film" in the Sinhala language! Free online movie-- click a picture below to start the video! A DAILY BIBLE SCRIPTURES PASSAGE / MESSAGE & (NEW) A DAILY PROPHETIC-WARNING QUOTATION / ALARM !! FCBH STREAMING BIBLE PLAYER IS HERE & OUR OWN AUDIO-VISUAL BIBLE (KJV) ALSO ! Our New BIBLE PLAYER STREAMS COMPLETE NEW TESTAMENT AUDIO BIBLES In 400+ Languages! READ Our Answers Page Called "QUESTIONS & ANSWERS ABOUT THE KING OF THE UNIVERSE"! READ Our Warnings Page Called "IMPORTANT QUOTATIONS... FOR THIS TIME OF CRISIS"! If you see only this sentence, it means your browser does not support IFRAMEs. LISTEN TO & READ FROM OUR FREE-ACCESS AUDIO-VISUAL BIBLES (FULL, OT-NT)... 1 - KJV - 2 - KJV - 3 - KJV - 4 - KJV - 5 - KJV - 6 - KJV - 7 - KJV ! FREE MP3 AUDIO BIBLES in ALL LANGUAGES at FaithComesByHearing.com ! THE WORLD'S GREATEST INTERNET SITE ! 400 languages... RIGHT HERE on this site, without ever leaving this page ! You can stream even a couple of complete (English) Old Testament Audio Bibles also. All streaming to you right here. Dramatized Audio Bibles & so many languages! hear God's own history of the world come alive in dramatized audio..! This is miraculous-- a real gift from God-- you've got to try it ! the streaming audio comes forth immediately ! Provided by the Jesus Information Network. 6 - KJV - 7 - KJV - 8 - KJV - 9 - KJV - 10 - KJV - 11 - KJV - 12 - KJV ! Click the pictures above to read each tract as an HTML slideshow! JesusChristSriLanka.com has links to more than 90 free Street Tracts and other good stuff! GO THERE! on the Solid Rock of God's own Higher Ground! because (as He has said) He's the Only One Who came down to the Earth from Heaven. but that His words will NEVER pass away! than are dreamt of in your philosophy, O Mortal Man! the True Manna that comes down to you from Heaven! Who is the Holy One, the Word of God, the Voice of God! in a Book written by the Holy Spirit of Almighty God! previously revealed since the Creation of the Universe. from sin, from death, from Hell-on-Earth & from Hell-after-Earth! 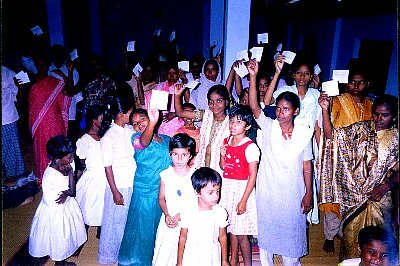 JesusChristSriLanka.com - Christian Gospel Tracts for Believers and Unbelievers! and win souls for Christ! Many Drowning Humans and To Bring These Gone-Astray Persons Aboard His Lifeboat! Here's a surprising fact that you maybe haven't ever realized: Did you know that Jesus still fishes... even though He's the rightful Captain of Spaceship Earth? Right now, He serves humanity as the Wise and Courageous Captain of Ark Jesus, Earth's Only Lifeboat, and He keeps His life-saving net always ready for quick use... even at a mere moment's notice! It's His Rescue Net, and it gets quite a lot of use, because it's essential to His plan for planet Earth. Jesus is an expert fisherman as well as the trustworthy Captain of His awesome Life-Ship. He fishes for men and women, for human beings of all sorts and of all races. Jesus often fishes struggling human beings out of deadly waters... when they would otherwise perish in a fatal disaster. He nets people and lifts them out of a catastrophe, bringing them to safety aboard a ship I like to call Ark Jesus. He's quite the Hero of the Greatest Adventure ever reported, and yet He still fishes, even today, even in our modern world. Yes, indeed! He rides quietly in His Ark, always searching for people He can rescue, and He's careful to keep that life-saving net always nearby! He'll jump up at any instant to use it successfully for another rescue. Never running out of emergencies, He always carries a Big Rescue Net aboard His ship. On the other hand, if you are simply a stubborn jackass or a stiff-necked idiot, God may instead surprise you by walking up softly and walloping you in the head with a big stick! Or He may even hit you in the head with a 2" x 4" board, in order to get the jackass finally moving in the right direction. That usually happens only when you are a really sinful unbeliever or what Jesus called "a lazy and worthless servant." You really need to start giving Him your full attention! I know what you're thinking. Jesus probably learned that little trick with the 2" x 4" board during his early years, back when He was just a humble carpenter in Israel! Maybe so! One thing's for sure: Jesus has used His construction skills to build for us a remarkably strong and sturdy Ark, a Lifeboat that He has created as part of His rescue mission to Earth... and only a very foolish and deceived person would ever fail to seek safety in that Ark. You may recall that a former US President named Teddy Roosevelt once advised the public that a person should "walk softly and carry a big stick." I think maybe God has a stick too... a rather long one that he uses to wake up people who keep falling asleep every time they listen to a sermon! Sometimes God may have to tap you on the top of your head rather forcefully, just in order to get your attention-- to get you to wake up and see the real world. And sometimes He may have to extend that staff to you so that He can rescue you from your own foolish error-- when you are drowning in a pit of Earth's quicksand, or when you are about to drown in Earth's deadly waters... in a grave misfortune, or in a sea of catastrophe. Now, how can I say that Jesus sails quietly with a Big Net, but that He also, at the same time, "walks softly and carries a Big Stick"...? It's like this: Jesus is not only trying to catch a lot of fish-- He is also gathering a lot of sheep, and He's trying to lead these very dumb animals toward the safety of Heaven! If you've never been caught yet by the Safety Net of Jesus Christ, it's probably because you've been resisting the Truth your whole life long. But Jesus is still extending His staff to you, even now-- a life-saving stick that you really should grab. It's a stick that can rescue you when you are otherwise going to drown in the quicksand catastrophe of life. It's a rod that can correct your erring path and guide you to safety. It's a rod of correction that will allow you, if you cooperate, to be lifted up and brought to safety aboard Ark Jesus. You will otherwise perish in the stormy seas of earthly life, just like so many other lost children. Take hold of the staff of Jesus Christ. Do it today, and you can be brought to safety in His eternal Life-Ship. With that staff of correction guiding you to the Truth and to His Heaven, you too can become one of the saved. Make Jesus your Shepherd, your Captain, and your King. Jesus Christ alone deserves such honor and respect... when absolutely no one else does. You don't deserve it, nor do your foolish idols, nor does the Prince of This World. Give all honor and glory to the Holy One only... Jesus Christ, the One to Whom all honor is due. "People are jaundiced in their faith today. Men are not engaged; they're not excited. A lot of men are not going to church anymore... they're falling away from their faith. And I believe that the greatest adventure is not what I do -- going to climb mountains, diving in the sea, looking for Noah's Ark, Mount Sinai, Paul's shipwreck, all the things that I've done. The greatest adventure in this world is opening up the Bible. And adventure begins with belief. The minute you believe you are entering into a new realm of adventure that you will find nowhere else on this planet. And that adventure is God... and the results are the greatest treasure you could possibly imagine... in the Universe." "Years ago, there was a Flood. And God called the animals and called Noah and his family into that Ark. And when that door on that Ark closed, it sealed all those outside... and they perished. It sealed all those inside... and they survived. You see, there's no spiritual Switzerland-- God calls us to be proactive; He calls us to a decision. He's calling you on the Ark today. It doesn't matter if we find an old beam on a mountain that we say is Noah's Ark... if you don't find the real Ark that's right in front of you. That real Ark is Jesus. That door is open. And God's calling you in. And if you go aboard that Ark-- when your heart stops beating, and that door is closed-- then when you're on that Ark, you're guaranteed eternal salvation and forgiveness of your sins. If you're outside of that Ark, you perish. There's an Ark in Christ, and God's calling you aboard it." -- Robert Cornuke, August 23, 2007. The sentences above, quoted from TBN's "Praise The Lord" and its TV program segment of August 23, 2007, were spoken by Robert Cornuke of the B.A.S.E. (Biblical Archaeology Search & Exploration) Institute. "Bob" Cornuke is a Christian explorer and an archaeological treasure-hunter; he is a Noah's Ark Hunter who was formerly a search-partner of the late Col. James B. Irwin. Col. James B. Irwin was also a believer in Christ, a Christian astronaut who walked on the Moon in connection with the Apollo 15 mission... and a driver of the first Moon Jeep. Col. Irwin is already in Heaven now with his Lord and King, having completed a High Flight to the Kingdom of Heaven. There he coninues his adventures in a realm much higher than that of planet Earth. Our major work-in-progress which we call The Eyewitness Bible (KJV-modernized) is persistently aiming for a still-future but undisclosed release date. The first e-book edition produced will undoubtedly be titled The Eyewitness Testimony Bible. A planned second (& enlarged) e-book edition, released to the public at some still later date, is to be titled The Eyewitness Evangelism Bible. This will be an alternate version with a lot of supplemental materials added at the back of the e-Bible. We anticipate the initial publication only in a Kindle e-book format, so it will be targeted for all the e-book readers out there. For those with Kindle devices or tablet computers, but also accessible through "Kindle For PC," by "Kindle For iPhone," & by "Kindle For Android." R. K. Street, Jr.'s two versions of his new Eyewitness Testimony Bible will someday have their initial release, currently projected as being for sale in a Kindle e-book format only & expected for the year 2014 or 2015. Ken is already at work composing and editing the material for these 2 study Bibles, to be constructed from the KJV text, with sequential modification & language modernization, in our unique "historical worldview" format. It's a more chronological design, with our own supplemental materials added as the special appendices for each version. Another variation of our big Bible project is a work-in-progress to be titled The Kingly Gift Tribute Bible (KJV-based). It should follow The Eyewitness Bible in publication order & perhaps have its official e-book release during 2015 or 2016. Likewise planned for a still-future release date are other variations of our Eyewitness Bible work-in-progress, such as The Manifest Destiny English Bible (KJV-modified) and The Shakespearean Providence Bible (KJV-modified) . We may also try to produce a multi-volume series of e-books to be called The Shakespearean Worldview Anthology, using a lot of out-of-print public-domain works by many of history's forgotten Christian authors. -- All these projected e-books are planned for a still-future release date, & are unlikely to be finished any sooner than the year 2015. Sorry for my slow rate of progress. The 5 new Bible versions described are all put together in a chronological-order format, so we are planning to label them all as variations of the "historical worldview study Bible". Designed & edited by R.K. Street, Jr , these are a very big project & will obviously require a great many hours of work to produce. Ken is already at work composing and editing the material for these 5 "historical worldview study Bibles." These are tentatively projected as being finally available for purchase in a Kindle ebook format by the time we have reached the years 2015-16. The unusual modern study Bibles here described are to be constructed from the KJV text, with modernization of language & modification for our chronological-order format, thus producing the design of our unique "historical worldview" format. It's a much more chronological design, with our own special materials added as the supplemental appendices for each version. Will 2014 also unleash in Kindle format Ken's epic travelogue, a multi-volume series which begins with Earth-Trekker's Dream, then proceeds onward in Earth-Trekker's Trail and Earth-Trekker's Voyage -- ? Well, we hope so! This multi-volume autobiographical work has had its first 3 big volumes nearly publication-ready since 2006. So we hope that e-book readers will soon be able to explore the Kindle version of Ken's first 3 Earth-Trekker books. If so, you can begin the trip with volumes 1 and 2, namely Earth-Trekker's Dream and Earth-Trekker's Trail. People may finally be able to read (electronically) all about Ken's foreign exploits & all the mind-boggling discoveries he made while traveling abroad in exotic parts of a very expansive world. His youthful journeys over the surface of planet Earth proved to be, ultimately, quite enlightening. Will e-book readers in 2014 finally be able somehow to marvel in the FANTASTIC and yet realistic travels-book that has been titled Earth-Trekker's Voyage: Exploring The Solar System, watching in awe as the young but fast-aging Earth-Trekker begins a fantastic otherworldly adventure...? R. K. Street, Jr.'s epic cycle of Earth-Trekker books begins with these 3 volumes. These 3 (of 7 projected) are part of an autobiographical / philosophical series with a world- travels theme, each about 400-600 pages long. The finished works in e-book format will provide a non-linear chronicle of Ken's own peculiar life journey. It will expose fully, in a very ample way, his wild and improbable journey through a lifetime of pilgrimage on planet Earth. The protagonist goes forward, indefatigable... from the childish Presbyterian Sunday School student to the proud Evolutionist and s-f fanatic, to the wide-eyed world-traveler, to his unfortunate days as a much-deceived New Age cult victim in India... and ultimately to his current mind-set as the conservative Bible-minded Christian and creationist, one who believes in Biblical prophecies about the return of King Jesus Christ. The latter mind-set has been with him for the past 33+ years, and he has not lost the certainty of his convictions in all this time.